SEBA Assam Board HSLC / AHM Programme Date Sheet 2015 Released. BSEA 10th Class Time Table 2015 available Now. SEBA HSLC Date Sheet 2015 – Download Assam Board 10th Exam Time Table 2015: Are you looking for SEBA HSLC Class Date Sheet? 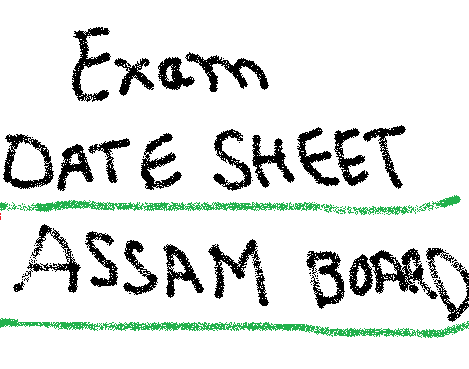 Assam Board 10th Datesheet 2015 is out. The Assam Board is all set to conduct its Class 10th examination and released the Programme. Students who are going to be appear in the Assam Board 10th examination can download their 10th time table now. Assam Board HSLC / AHM Time Table 2015 will be available on Manabadi Results - www.aptsmanabadiresults.in. The Assam Board of Secondary Education (SEBA) is all set to conduct the SEBA HSLC / AHM Class Annual Exams 2015 in Feb / March 2015. Assam Board 10th Date Sheet Programme 2015 is now available for download from below. Students are very excited for their Assam Board 10th exam Programme. Written examination for SEBA HSLC class was held during February / March 2015. A very large number of students are going to appear for this Annual examination. Now all of them are very eager to know their SEBA HSLC / AHM class Date Sheet. Exam Time Morning from 9:30 a.m. TO 12:30 p.m. (Except for papers with Asterisk)Five minutes extra time will be allowed from 9:25 am to 9:30 am to read the question paper only. The officer in charge will arrange distribution of question papers accordingly. Time Allowed (2) Hours (9:30 am TO 11:30 am). Modern Indian Languages (MIL) : Assamese, Bengali, Hindi, Bodo, Manipuri, Nepali, Khasi, Garo, Mizo, Hmar and Urdu. There will be separate question papers for the subjects - Assamese, Bengali, Hindi and Urdu MIL, for High Madrassa candidates having 50 marks and time duration 2 hours. Elective Languages (Time 3 hours) and In Lieu Languages (Time 2 hours): There will be common question paper with groups A and B for each language (viz Namely - Assamese (E), Bengali (E), Hindi (E), Bodo (E), Manipuri (E), Santhali (E)), irrespective of Elective or Lieu Language. Candidates appearing for Elective subject will have to appear in both the groups A and B while for In Lieu language the candidates will have to appear in group A only, which will be treated as Assamese (IL), Bengali (IL), Hindi (IL), Bodo (IL), Manipuri (IL) and Santhali (IL) respectively. There will be separate question papers in the subjects English, General Science, General Mathematics, Hindi MIL (HSLC and AHM) and Computer Science (E) for the candidates of New & Old Course.